Another "Games About Games" video, where my friends try to distinguish between Metal Gear and Mega Man X characters. Anyway, this is an unboxing of ShiftCam's RevolCam! 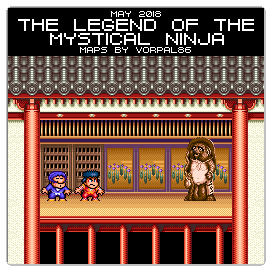 I didn't forget that it was MAR10 Day this past Saturday, but I was too busy editing my Mega Man X: Maverick Challenge video for my "JonLeung1" YouTube channel that I only played my daily run of Super Mario Run on my iPad and briefly got a few Mario items in Animal Crossing: Pocket Camp on my Android phone. The tides are changing if the only Mario games I played on this day this year are apps! Earlier this month, I got the new costume items in Super Mario Odyssey (Switch) and re-upped my Coin total back to 9999, but I haven't actually played any of the Luigi's Balloon World DLC yet. 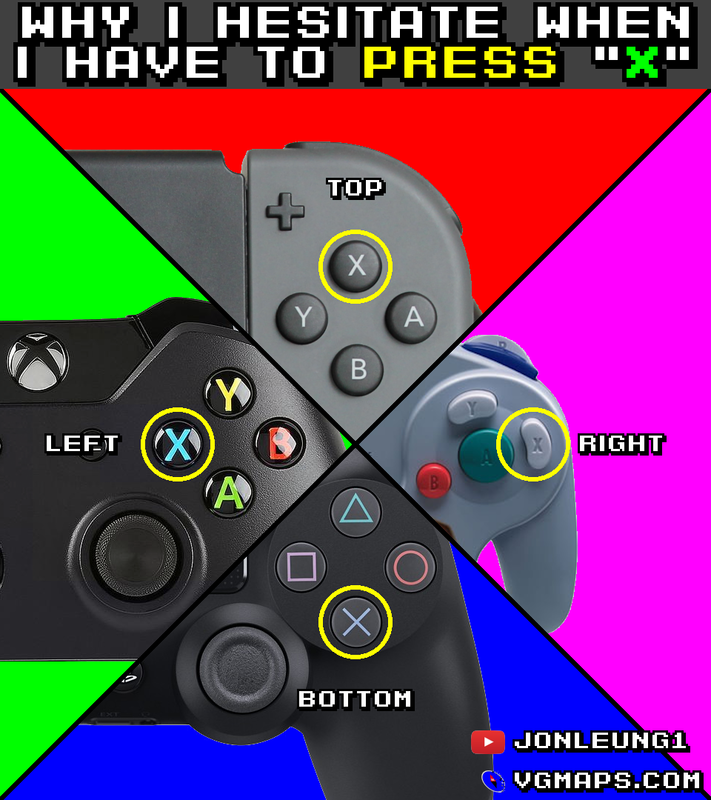 The letter X sure is confusing when it comes to video games. 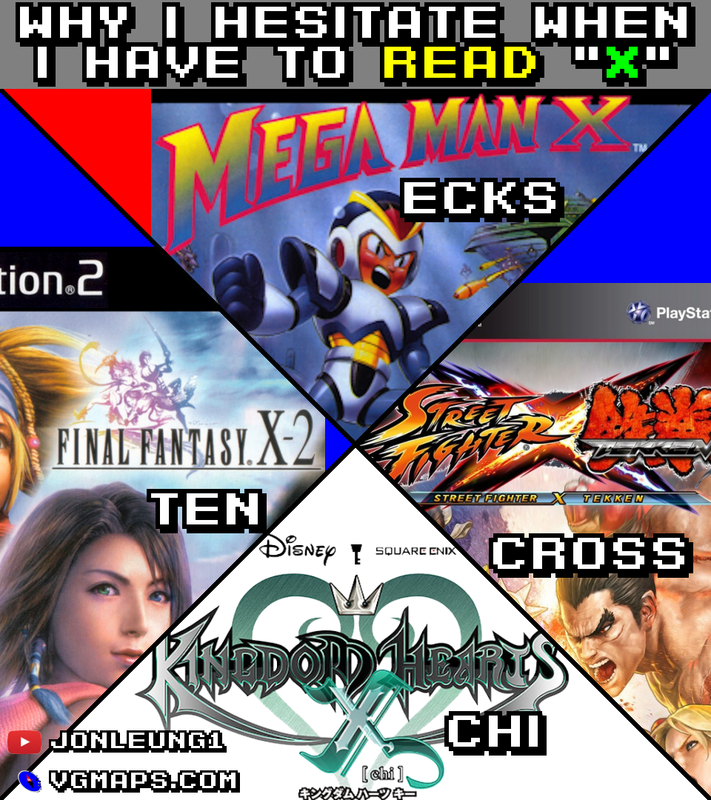 Here are some images I made while working on my latest YouTube video about Mega Man X. 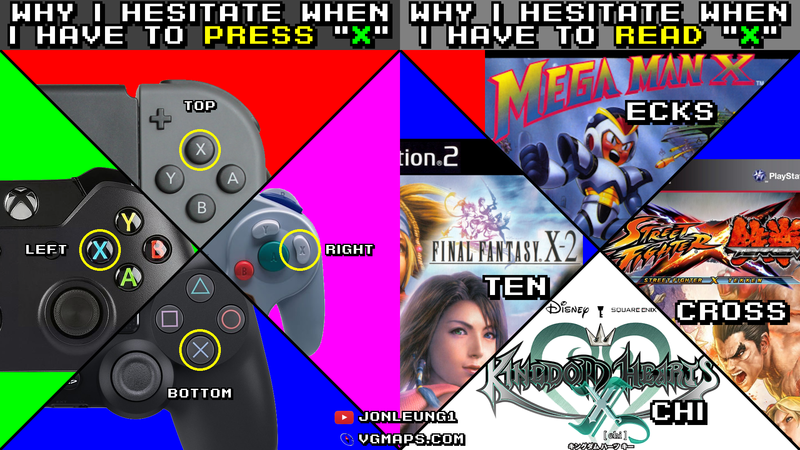 The controller one is something I've seen before, but decided to remake it so the image would be consistent with one about the game titles that use "X". There are both still images and animations of each below. The long-awaited follow-up to the "Mega Man: Robot Master Challenge" is, unsurprisingly, the "Mega Man X: Maverick Challenge". Check it out! Having some standards for quality control is one thing, but being too insistent on perfectionism, at the cost of functional-even-if-not-the-prettiest maps, is definitely a loss. Because you can always resubmit maps (and I know you and a couple others already have that habit), you can always go back and redo or clean up maps if you find a better way to present something. You could use a version number on maps, if you are inclined, and use a version number of less than 1.0 (as seems to be the norm) if you feel a map is incomplete or could be revisited. Or some kind of footnote, disclaimer, indication that the map is not complete. I know such text could potentially clutter it, but it is an option. If you have something that is presentable, might as well get it up so it could be of use to someone, rather than have it sit on your hard drive forever if you don't know when or even if you will have a chance or the means to improve it. Now, I don't want a deluge of unfinished maps. ("Presentable" is key.) 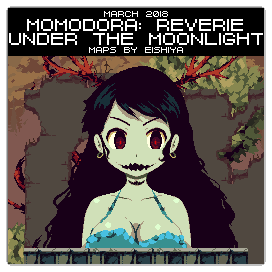 But as you can see, we almost went a whole calendar month without new maps - and actually did go over a month without maps, from Dec. 28 to Jan. 30 (and then suddenly got some maps for three games from two mappers on that day) - so having updates of some sort would be nice to show this site isn't dead. A few years ago updates were guaranteed weekly! For multiple games each weekend! There was a time when for a huge stretch I didn't know what an updateless weekend was like! But now, a bit of a different story, but surely we can do better than a month between any maps at all. For this month's "Maps Of The Month" featurette, I wish to draw your attention to G.E.R. 's Sonic Mania (PC) maps. Taking place after Sonic & Knuckles, Doctor Eggman sends some EggRobos to Angel Island to retrieve the Phantom Ruby. Sonic, Tails and Knuckles are sent back to areas from their previous adventures, and must chase down Doctor Eggman and his EggRobos - now the Hard Boiled Heavies - to stop the Phantom Ruby from being used for evil. The latest 2D Sonic game (as of now) is actually pretty good, very much in the vein as the original games from the Genesis. In fact, many Zones from those early games return, such as Green Hill Zone and Chemical Plant Zone (gotta love that music). Fitting, as this game commemorates the series' 25th anniversary. Even if not entirely original, there are some nice surprises, and it's still a standout retro game, in an era where retro games are a dime a dozen. 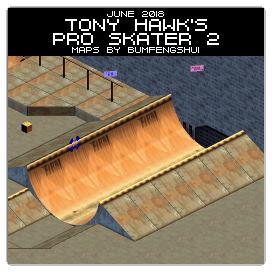 Plus, it's always good to see a Sonic game fully mapped! 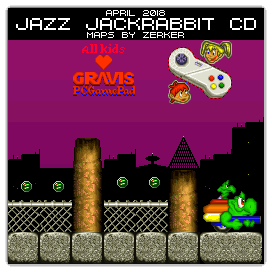 So to recognize the effort put into mapping the latest hedgehog game for Groundhog Day, G.E.R. 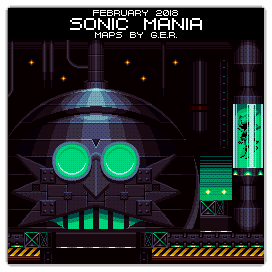 's Sonic Mania (PC) maps will be known as VGMaps.com's Maps Of The Month for February 2018. Decided to review the elgato green screen I recently got (thanks to bustin98 for helping me out, too)! I actually managed to conceive of, film, edit and publish this video all within one day! Hopefully future videos using a green screen will look better than the old green cloth I used to use... for like the one Mega Man video, heh. But you can expect more soon! I know there are some techy guys out there, I wonder if you guys would know anything about music extracting, recreating, or cleaning up. There are two songs I would like tidied-up versions of, but there are other sounds that get in the way, and no full version exists that I know of. Anyone have the ability to extract, edit or remake these? - could it somehow be extracted from the Wii ISO?